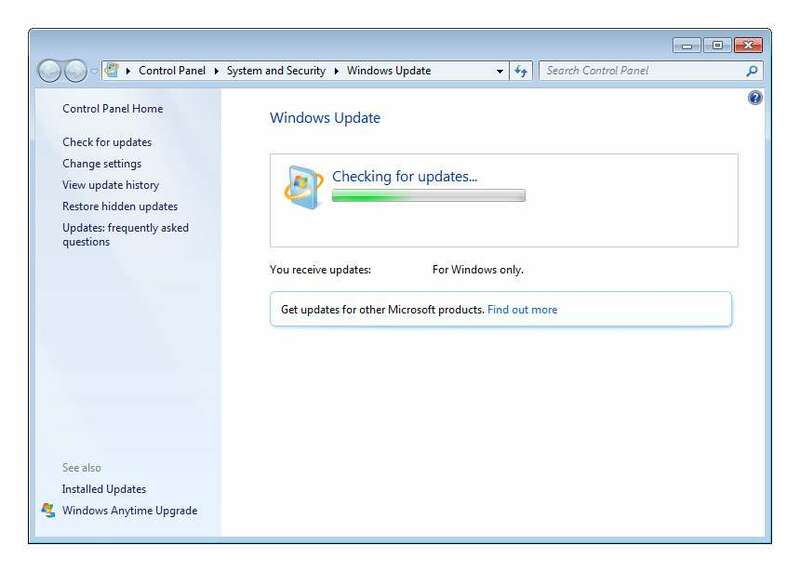 We began to notice that on fresh installs of Windows 7 Professional SP1 downloading and installing updates was taking and increasingly longer amount of time. Since Microsoft has only released one Service Pack for Windows 7 the list of individual updates has grown to over 300 Important updates. Initially we thought that the huge number of updates was the reason it took so long. No doubt that is part of the problem, but when it started taking a day or more we knew something else was going on. After installing Windows 7 and running the motherboard drivers we would go to Control Panel, System and Security and select to Check for updates. At this point the system would just hang on Checking for updates as seen below. It could stay like this for hours and the system didn’t really seem to be doing anything, checking in Task Manager under Network Usage would show no activity. Eventually it would find several hundred updates and you choose to download and install them. After this initial large update install the update process would go much smoother. This seemed to get progressively worse to the point that it became nearly impossible to run Windows Update on a fresh install of Windows 7 SP1. You can download the update from that page, just choose the version of Windows that you are using. When you download the file and run it, it is a standalone update installer and installs improvements for the Windows Update Client. Once the update is applied you can go back to normal Windows Update in Control Panel > System and Security > Windows Updates to finish downloading and installing all the updates. You need to have Windows 7 with Service Pack 1 applied to install this update. This also Applies to Windows Server 2008 R2 SP1.